If you’ve ever watched a science fiction flick, you’ve probably seen people in pods. Maybe they were traveling to another galaxy in suspended animation. Maybe they were hooked up to a computer matrix, bamboozled into believing in a counterfeit reality. Maybe they jumped into a one-man escape capsule to hide from aliens with freaky extensible jaws. Whatever the story logic, the image of people in personal life support units is near-universal in the sci-fi genre. And hey, we’re living it. I don’t mean literally, of course ... there’s no protective plexiglass bubble enclosure six inches in front of your face that you can reach out and touch. You’re not being fed by tubes and breathing recycled air as you read this — or I hope not. 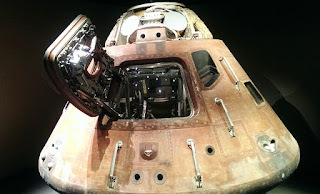 But the astronaut in his pod goes into a foreign — even hostile — environment while remaining securely connected to home and fully supplied with everything he needs. In theory he is an explorer, but in reality his own senses never make contact with the world he explores. He makes no independent decisions. His view of the universe around him is filtered through the programming of the world he came from. Today, many of us, especially young people, might as well be living in hermetically sealed pods. For all the exposure we have to ideas that break with the received wisdom of our cultures — the “narrative” — we may as well have a stream of politically correct ideology pumped directly into our brains. YouTube shows us video after video of zombie-like university students chanting their mantras and banging cowbells to drown out the sound of any brave, lonely soul who might attempt to articulate a counter-narrative. They are, entirely by choice, living in pods of their own making, cut off from any hope of rational discourse. You might as well attempt to reason with a tidal wave or an attacking cloud of wasps. My older co-workers are not a lot better, mentally dancing to the tune of CNN and The New York Times. Driving to work this morning, it dawned on me that civic nationalism is dead. Over. Toast. History. The notion of assimilating people from all sorts of different cultures into a “proposition nation” — the much-applauded American Dream — is an unworkable, impossible un-reality. Assimilation was a lovely idea. The melting pot fantasy. Civic bonds forged by a common set of convictions or goals rather than skin color, cultural background or blood relationships. Different cultures united to pursue life, liberty and happiness on our own terms, or so goes the theory. We’d like to teach the world to sing in perfect harmony, don’tcha know. On its face, civic nationalism seems so similar in some ways to Christian brotherhood that the two are frequently confused. But they are nothing alike. First, Christian unity exists not because the early believers thought it might be a cool basis for a republic but because of a sovereign act of the Holy Spirit, “for in one Spirit we were all baptized into one body — Jews or Greeks, slaves or free — and all were made to drink of one Spirit.” Hey, amen to that. But such unity is supernatural, not normal human behaviour at all. The early Jewish Christians were more than a little resistant to the concept, not least because it is profoundly counterintuitive. Second, the basis for Christian unity is love, not a common ideology or a series of agreed-upon propositions. Paul says, “I therefore ... urge you to walk ... with all humility and gentleness, with patience, bearing with one another in love, eager to maintain the unity of the Spirit in the bond of peace.” God’s love is the glue that unites believers in Jesus Christ, and the world has no substitute for that. Third, political unities, however temporary, are achieved through trade-offs, compromise, enlightened self-interest or the exercise of raw power. Christians, on the other hand, are unified when they sacrifice, serve and submit (“with all humility and gentleness”). Fourth, the purpose of Christian unity is testimony: “that they may become perfectly one, so that the world may know that you sent me and loved them even as you loved me.” God wants Christians speaking with one voice to exalt the glories of Christ. The forces behind the “proposition nation” are not quite so forthcoming about their purposes. Civic nationalism is nowhere to be found in Preamble to the U.S. Constitution, which speaks only of securing the “Blessings of Liberty to ourselves and our Posterity”. Taken literally, this refers to the Americans of 1787 and their children who, according to the available historical data were 81% of European descent, most of that British. The question of whether the Founders intended to include American blacks and what was left of the indigenous U.S. population in the phrase “ourselves and our Posterity” is a matter of debate, but it seems incredibly unlikely given that slavery did not end for another 100 years and the American Indian Wars continued sporadically into the 20th century. Never in a million years did Jefferson, Franklin, Adams and the rest anticipate the post-1965 stampede to the American shores from the four corners of the planet. Emma never bothered to mention precisely what America was expected to do with all this “wretched refuse” (hey, it’s HER term), and it seems a bit silly to ask the Constitution to rationalize this modern American myth when its framers never considered any such thing. Still, the “nation of immigrants” meme is out there in the culture, and it owes its origin to Emma and her ilk. We cannot ignore the fact that it resonates powerfully with white liberals today. Why bring up ancient history? Primarily to point out that the “proposition nation” was always a bit of a questionable proposition anyway. The idea that anyone from anywhere can become truly American (or for that matter Canadian or European) simply by setting foot on the soil of another country is a product of sentiment, not historical observation. Lasting unity doesn’t usually come about that way. Multi-ethnic empires have a spotty track record going back millennia. One reason the Roman Empire lasted as long as it did was that it preferred to tax the nations it conquered rather than attempt to absorb them or disperse their peoples. But ask a Roman how incorporating the Visigoth tribes into the empire worked out for them, in the unlikely event you can find one. Nations with a common ethnicity and culture are resilient. Multi-ethnic empires have less structural integrity. As in the feet of Nebuchadnezzar’s statue, like and unlike simply do not cohere. Still, despite obvious racial tensions that rear their ugly heads periodically, America appears to have absorbed tens of millions of immigrants since 1965 with some degree of success. Why would I suggest that civic nationalism is no longer a viable option? Primarily because technology has killed the proposition nation as quietly and efficiently as one might slip a silk pillowcase or a plastic grocery bag over the face of a man in a coma. The Internet has murdered Emma Lazarus’ grand notion in its bed, and nobody has quite got around yet to acknowledging that the patient has kicked the bucket. Quite simply, almost nobody assimilates anymore. They don’t have to. We are living in the Age of the Pod People. A hundred and fifty years ago, new arrivals assimilated to the existing culture. After all, there were few options. Going back by ship was expensive and took forever. Today, you can book a relatively cheap flight back to almost anywhere in the world for the end of this week. You can live and work in your pod in North America or Europe even if the place you really call home is anywhere else on the planet. The emotional attachments barely sustained by a series of letters sent further and further apart can now be invigorated through cheap, daily Skype connections. Grandma can spin her laptop around and show you the old community out her apartment window. You never have to really leave home. And why bother listening to or watching the CBC or NPR in your new country when you can livestream Al Jazeera? For that matter, why even learn another language at all? If one or two of the bigger income earners in the family can speak English, that’s perfectly sufficient. The Arabic Muslim enclaves around my home are mostly non-English speaking. But then, with fellow Arabs for employers, employees and customers, and with their own restaurants, mosques and non-English speaking family members to go home to, learning to communicate with their fellow citizens from other nations is, for most, quite superfluous. I work with a man who takes ten weeks of vacation in East Africa every second summer. That is his real home. Canada is just the place he gets free health care and a good job. His citizenship is Canadian, his real allegiance unabashedly and entirely Ugandan. Where immigration is concerned, this is the new normal. But never mind immigrants: their indifference to assimilation is just a symptom of a much larger issue. Technology has given rise to other kinds of fenced-in, self-reinforcing environments. School has become an ideological pod that its students never really leave, even when they are no longer physically in attendance, and the programmers are starting on your kids earlier and earlier. A hundred years ago, boys eventually became men and girls eventually became women. What was the old line? “If you are not a liberal at 25, you have no heart. If you are not a conservative at 35, you have no brain.” Today, there’s no need to grow up at all, let alone become conservative or fiscally productive. Outsourcing and various other government policies have ensured there probably won’t be a job for you out there anyway, and there’s always welfare. Why not just lock yourself in your pod with your self-reinforcing Progressive worldview pumped in via your unhappy Internet friends who are all in the same boat? But the bleating sheep protesting against free speech in our universities are not all that different in their views from the forty and fifty year olds who sit at the next table in my local restaurant or in the next cubicle at work. What they have in common is not some delivery tube at the base of their brainstems, it’s the Internet connection in their iPhones and laptops delivering endless PC platitudes in a thousand different ways every day. Google’s algorithms, Facebook’s ads, Twitter’s trends: every one of them is based on the viewing choices you made yesterday, and offers to show you even more of the same. If you want to learn something new or contrary to the narrative, you’ll have to actively search for it. Stay in the pod, and you’ll just keep getting more poddish. In our tech-enabled society, a liberal at 25 is a liberal at 35 and a liberal at 85, and chances are that the remaining conservatives on the Internet will fossilize themselves into irrelevance by living in their own ideological echo chambers. Our pods relentlessly polarize us, and we just keep getting further apart. Bottom line here. What does all this mean for believers? 1. Expect increasing racial tensions, especially in cities. As with the Roman Empire in its latter years, multi-ethnic societies are fragile and difficult to govern, and multi-ethnic pod societies in which the prejudices of each minority are regularly reinforced (via technology and the support of significant numbers of family and friends living in the same areas) are bound to be even less cohesive and stable. In our major cities, we may not have long before safety in the streets becomes a serious issue. It’s maybe a little bit too easy for Christians to glibly say we’re game to be persecuted for our beliefs. It’s time to really count the cost and consider how we might have to modify our home, work and church lives in view of social unrest. 2. Immigrants probably will not come to us. I hear a lot from Christians about the great opportunities to witness to new immigrants in a multi-cultural society. “Hey, guys, the mission field is coming to us!” Terrific, if we’re ready for it. But we need to recognize the onus is on us to break into the bubbles in which new citizens may live quite comfortably once they settle in. Immigrants probably will not come knocking on our doors as they might have done in decades past, at least not in large cities where there are excellent support systems in place for minorities from just about anywhere. 3. We need to recognize the potential hazards of Pod-People thinking. The Democrats, which I suspect vastly outnumber American conservatives, lost November’s election because most of them had stopped listening entirely. They live in pods, enjoying their own opinions regurgitated back to them endlessly. As Christians, we need to start listening more to the people around us. We may find they are quite different from what we have assumed. Different needs, different problems, different ways in which the word of God can be applied to their lives. 4. We need to immunize our kids against Internet stagnation. A liberal echo chamber is an appalling thing. We ought to be careful to ensure our kids are not living in one. Pick their brains when they come home from school. Challenge them gently when they pay lip service to PC pieties. But we should acknowledge that living in a Christian Internet “pod” can make teens just as tone-deaf and irrelevant. They need to be regularly exposed to other points of view and challenged to find the weaknesses of those ideas from scripture. Either way, don’t let your kids coast by just recycling YouTube talking points, even if they are perfectly satisfying Christian talking points. Find out whether they really understand and have internalized the information they are absorbing via technology. The Pod People are here. We meet them every day. Let’s hope they aren’t.